Between the brutally cold RL weather and my weighty SL obligations (such as serving on momentous juries), I need a bit of time to mellow. So I was playing cowgirl and riding my rocking horse when I began chatting with Dale. Dale is rarely idle, preferring to script, build or meander about. This time the work to hand was building a new look: new skin, new shape, new clothes. I pointed out that since Dale IS my Script Wizard, there was no reason not to come and create at my place, while I watched. One of the COOLEST looks Dale achieved was the result of a viewer mishap. Maybe “mishap” is too strong a word. Probably it should be called a nuance or a foible. At one stage of the creation there was a white line on the top of the outfit. Because of how it was rezzing, the line appeared to be flickering, moving horizontally across the dress (think of a ticker tape running along the bottom of screen, but more as moving white dots). It was GREAT. Unfortunately, if you adjusted your camera angle at all, the flickering stopped. Of course we immediately tried to figure out how to build or script to make that line move like that all the time. Given that it was late and we were both multi-tasking, we didn’t solve that puzzle then, but it was fun spec’ing it out. Building in SL is such fun because you can be working hard even as you are playing. Notice that although Dale APPEARS to be riding the rocking giraffe, you can see the little dots leading from hand to prim, indicating that Serious Work Is Being Done. *grin* Alas, one of the issues with prims is often that they are not flexible, even if made flexi. Camera angles also have major impact on appearance. What didn’t change that evening, however, was my enjoyment of my wooden pony! 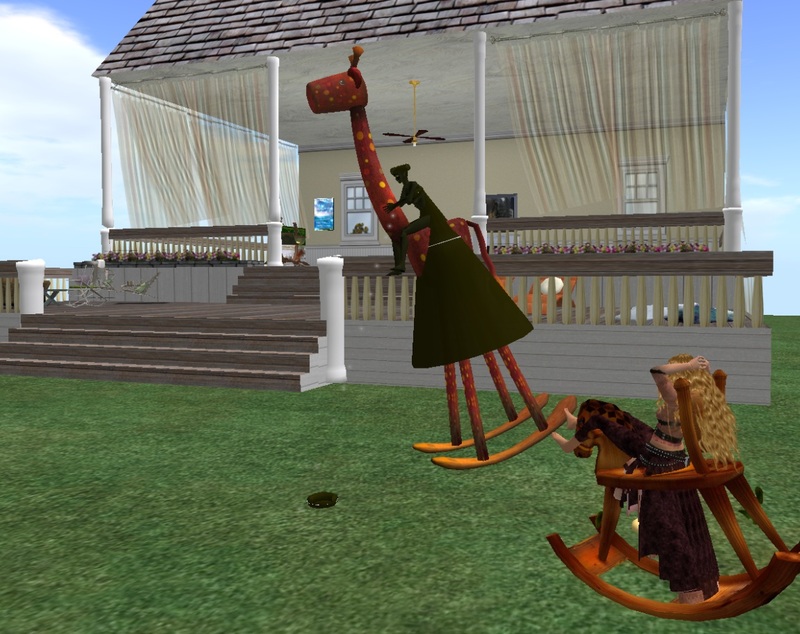 The rocking giraffe is from D-LAB, created by dazai Voom. The rocking horse is from HPMD, created by Sasaya Kayo. The bubble chair, as you might recall, is also from Sasaya Kayo and Happy Mood. *grin* Happy Mood is a WONDERFUL place. That was indeed fun. 🙂 The problem with the flexi version is that only single prims, not objects, can be flexi, so when the lower-clothing (“skirt”, as you earth-humans would say) main prim flexed, the white aesthetic-concentrator prim would stay where it was, producing something other than the desired result. you mean your girdle right? share some stories/information. I know my subscribers would appreciate your work. Highly energetic blog, I liked that a lot.